Teachers at the Mongolian Quilting Center continued to teach courses sponsored by the Mongolian Government to unemployed women. They also received funds from World Vision and the British and US Embassies to teach groups of women in the Ger District (a shanty-town of yurts on the outskirts of Ulaanbaatar) and in the rural provinces. The Center received a grant from the Boroo Mining Company and was able to make improvements to the facility including expanding into the porch area which enlarged the shop floor. They also built a new counter and bought a proper cash register. We raised $13,300 in USA towards operating costs which accounted for approximately 25% of the annual budget. We procured a $2,000 Millennium Development Grant from the Episcopal Diocese of Olympia, WA to assist five low income Mongolian women at the Center who were each paid $100 per month for four months. This income had a significant impact on the wellbeing of these women. Here are their stories. Nyumka was born in 1975, in the Tuv province of Mongolia. She is the daughter of a farmer and has nine brothers and sisters. This large family lived in rural Mongolia, where Nyumka attended school. During a physical education class, Nyumka fell, injuring her left leg. Due to poor medical attention, her leg did not heal properly. Her family spent much of their earnings on treatment and the injury caused her to spend seven years in and out of hospitals. Nyumka only completed a grade 8 education and she was unable to finish school due to the constant pain in her leg. Nyumka's injury resulted in an infection of the bone, so she had surgery in 1997 to remove part of the bone. Now she walks with a limp and must use crutches to get around. That year Nyumka and her family moved to Ulannbaatar seeking further treatment, and there she met her husband. Now Nyumka lives with her husband and two children, aged five and 14. Nyumka still incurs monthly medical expenses with frequent doctor's visits and the need for special shoes and medications. In the past, Nyumka attempted to work outside the home to provide income for the family. Her husband worked as a plumber, but the wages were not enough to support the family. She tried house cleaning, but standing for long periods of time proved to be too difficult. She tried to market her cross-stitch work, but it was time consuming and not profitable. She completed the four week skills training at the Mongolian Quilting Center and is now quilting at home using silks and cottons, as well becoming an assistant teacher at the center. She knits and crochets items for retail. She uses a hand-cranked sewing machine to make quilts. Six months ago, Nyumka wondered how she could contribute to her family's needs, now she helps train others and completes sewing projects at home, where she can be with her family. She is proud to be able to purchase school supplies for her children and no longer feels isolated. The money Nyumka earns has eased the stress in her family. She is happier and healthier and as a result, her children and husband are also happier and healthier. She is providing a healthier lifestyle for her family, with healthier food. Nyumka wants to become an expert professional quilter someday and is currently saving money for an electric sewing machine. She hopes to become a quilting teacher and one day show her work in quilt shows abroad. Nyumka would like to thank her husband for his help and support and the Mongolian Quilt Center for helping her to create a profession that she can take great pride in, and that helps sustain a healthy family. Ulzii was born in the Middle Gobi Donjali province of Mongolia. After graduating from high school, she moved to Ulaanbaatar and worked as a baker's assistant for 6 years. Later she met her husband and they married in 2006. Her husband works as an electrician and is currently studying Shamanism. They have two children, aged three years old and six months old. Ulzii and her family live in the outskirts Ulaanbaatar in the Ger District. Typical of life in the Ger District, they must walk through rough terrain, which is icy in winter, two kilometers everyday to fetch water, get food and supplies or catch a bus. They use coal for heat during the five months of sub-zero temperatures. The coal is costly, but necessary. When Ulzii gave birth to her second child, she did not receive maternity benefits. There is no child care or kindergarten nearby and often Ulzii is alone with two small children, as her husband's small salary requires him to work long hours into the night in the city. When Ulzii found the article in the paper introducing Mongolian Quilting Centre it made sense to call. She took classes at the centre, learning skills in knitting and sewing. These skills have allowed her to work at home, quilting and making crafts. She uses a hand-cranked sewing machine and she can work creating projects for the much needed income generated by her own hands, and still care for the children. The Mongolian Quilting Centre has provided Ulzii with friendships and connections in the community and pride in her work. But most importantly a substantial income, that with her husband's salary, makes a livable wage. She is now saving for an electric sewing machine. Bindyrya was born in 1966 in Ulaanbaatar Mongolia, and raised in the province of Khentii. After grade 10 she graduated from nursing school. Later she earned a teaching certificate in Fine Arts. She taught painting for a number of years and then worked in the textile industry. She currently lives in Ulaanbaatar with her husband and two children. In 2002, at the age of 36, Bindyrya suffered a stroke. The stroke has impacted her life enormously. She is extremely sensitive emotionally, slow to comprehend language and concepts, suffers from high blood pressure and tires very easily. She is making a slow recovery, but requires medications that are very expensive and often can not afford to buy them. However, she works hard to improve her life. 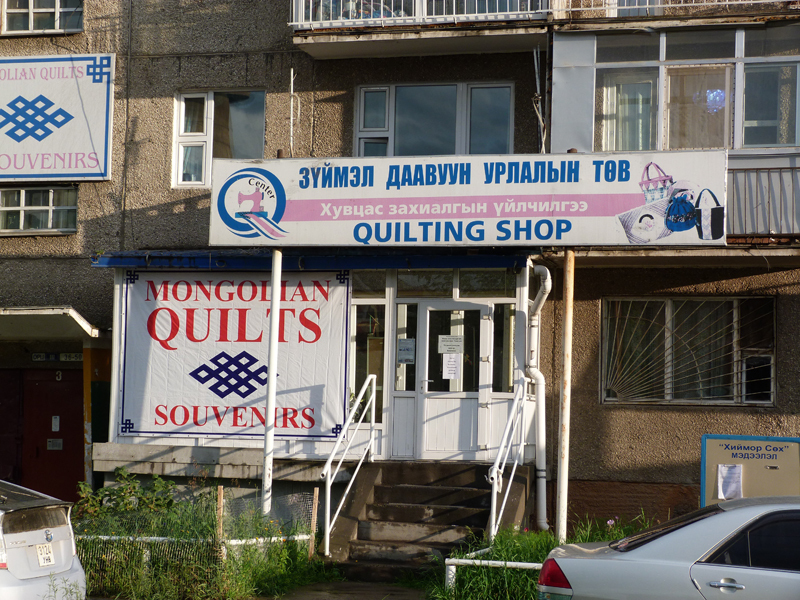 Four years ago, Bindyrya signed up for classes at the Mongolian Quilting Centre. There she learned to quilt. The opportunity to learn this skill has changed her life for the better. She takes pride in her work and enjoys what she is doing. "I love the work." Even the doctor is amazed at her progress and believes the repetitive work she is doing in quilting has helped with her recovery. She is more independent, able to contribute to the household financially and has a much more positive outlook. She is physically and mentally able to meet the challenges of everyday life and to purchase the medications she needs. Bindyrya is optimistic about the future. She loves her work and takes pride in doing a good job. She feels she can save money and wants to build a greenhouse, plant a garden and even get some chickens. She is saving for an electric sewing machine. When asked about her favorite part of quilting, she says she loves to make the twisted Log Cabin, and purple and green are her favorite colors. The Mongolian Quilting Centre has provided much needed help for Bindyrya's health and well being. Dagwa was born in 1953 in the Bulgan province northern Mongolia. In 1973, she graduated from college with a teaching certificate, and began teaching music to children from elementary to secondary school age. In 1974 Dagwa married and had three children, one of whom was born with a disability. Unfortunately, Dagwa's husband died, leaving her to raise the children alone and survive on meager wages. She lives in the outskirts of Ulaanbaatar. Despite the two kilometer walk to public transportation through difficult and dark terrain, no central heat, and the arduous task of carrying water to the house daily, Dagwa worked as a teacher until she retired at the age of 55. She saved her money cleaning other people's homes, along with her pension, and eventually built a small house for herself and her children. An independent spirit, she refused to ask for help from others regardless of life's difficulties. Dagwa was supporting herself, her disabled son and two grandchildren. After retiring, she felt isolated from the rest of the community, and struggled to making ends meet. Then she saw a TV advert for the Mongolian Quilting Center and immediately signed up for classes. Dagwa proved to be an excellent student. She quickly learned to crochet, knit and quilt, amazing her teachers with her ability to work with accuracy and speed. The Mongolian Quilting Centre has provided Dagwa with work she can do at home, allowing her to care for her disabled son, and grandchildren. The classes at the Center provide social networking, and the piece work brings in vital income as well as an opportunity for creativity. For three years the Center has been helping Dagwa supplement her income, make friends, and inspire others to do their best. Her integrity and determination have been an important example of what can be done, and even her son, who despite a physical impairment leaving him unable to travel, follows her lead, teaching students language skills and literature from home. Lham was born in 1971 in the Eastern Dornad province in Mongolia. She is 42 years old and is married with two children. Lham is very sociable, has many friends and enjoys company. Unfortunately she has health problems. She fell off a horse when a young girl, and as a result has permanent damage to her right arm. She also has a heart condition that requires daily medications. Lham has worked hard all her life in spite of her physical impediments. She earned a degree in baking and worked as a baker and pastry chef, but long hours and continual standing caused her health to decline. She decided furniture building would be a better option, but she found the long grueling hours and poor conditions too difficult. It is two kilometers walk along unlit and unpaved roads to catch the bus. Lham was taught to sew by her mother when she was young, and began sewing from home. She started a cottage industry, taking orders, making uniforms and doing alterations. She could work at home and still care for the household and family without relying on public transportation. She wanted to rent a small shop in the city to get more business, but could not afford this. Then she saw an article in the paper with information on the Mongolian Quilting Center and went to the Center to learn new sewing skills and how to make products to sell. Now Lham has money for her heart medications. She can continue to expand her skills as a seamstress while feeling comfortable working in a familiar environment. She can buy fresh fruits and vegetables. She is saving to build a house of her own, a dream that is slowly becoming a reality. She still hopes to open her own small alterations business one day. Her latest short term goal is to buy a rotary cutter and a ruler, and to improve her quilting skills. With help from the Mongolian Quilt Center, Lham has made positive permanent changes in her life.